Thank you for considering SandTec® for your respirable crystalline silica dust needs. 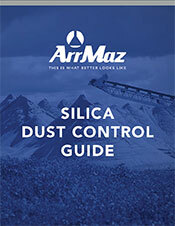 Click below to download ArrMaz's Silica Dust Control Guide specifically tailored for companies operating across the hydraulic fracturing supply chain. Your regional ArrMaz account representative will contact you shortly to answer any questions you might have about SandTec®.